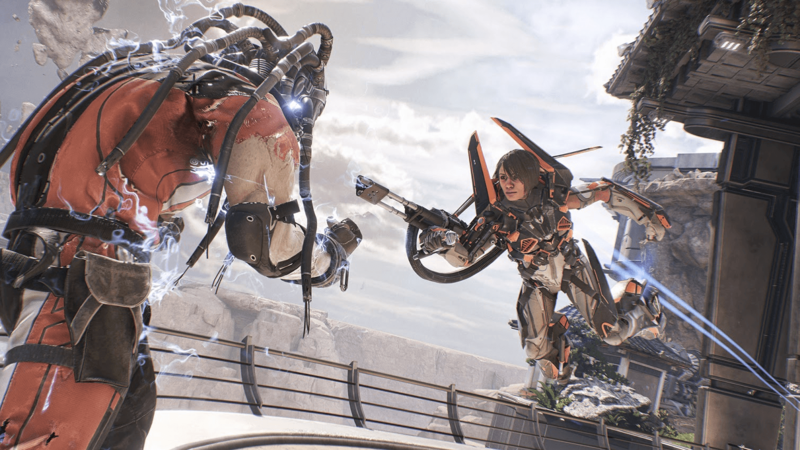 In a panel presented at the Game Developers Conference (GDC) today, industry veteran Cliff Bleszinski and the team at Boss Key Productions announced that their upcoming multiplayer FPS LawBreakers, will be available exclusively on the Steam platform at launch. Fans are able to add the game to their Steam Wishlist starting today, by visiting http://store.steampowered.com/app/350280. LawBreakers is an upcoming new first-person shooter in which even the laws of physics can be shattered, creating intense gravity-based combat and resulting in an ever-evolving and bloody arena. Set in a futuristic rebuilt America, players will choose whether to kill for the nobility of the “Law,” or go out for blood as a “Breaker,” as they take part in the conflict raging across iconic locations including the boiling oceans off the Santa Monica coastline, to a gravity ravaged Grand Canyon and nearly unrecognizable Mount Rushmore. Boss Key also announced LawBreakers will be a digital premium title when released. While the price has not yet been announced, they assured the audience it will not have the $60 price point of a traditional box product. Addressing how to make a new FPS stand out among heavyweights in the industry, the panel – titled “Surrounded by 800 lb Gorillas! Standing Up to the Competition” – also revealed LawBreakers’ shift in design to embrace a more mature look and feel, and gave attendees a first look at a revamped logo, game models and screenshots illustrating the new tone and attitude, which will feature variable gravity effects, unique roll-based movement systems and truly three-dimensional combat realized through grappling blades, reverse blind-firing, time dilation, jetpacks and more. Fans who want to be among the first to experience the R-Rated gravity-based combat and dominate the competition will have a chance to get their hands on LawBreakers at PAX East next month in booth #5116 in the Boston Convention Center. Everyone who plays will get exclusive swag and a chance to commemorate their best kill with a custom-made video clip. Additional details on availability and public tests will be announced in the coming months. We explored all of our options and determined Steam is the best fit for our community and the competitive game we’re building. Why did Boss Key/Nexon decide to make changes to the game’s business model? After careful consideration of how the game has been progressing, we realized free-to-play wasn’t the right fit for what we’re building. Lawbreakers is a competitive game at heart and that means balance is a big priority. Using a digital premium model helps ensure an even playing field by giving fans access to every available role without barriers. How much will LawBreakers cost at launch? The price at launch hasn’t been revealed yet, but we want to provide a high quality, digital downloadable game at a compelling price. LawBreakers will not have the $60 price point of a traditional boxed product. Are you developing LawBreakers exclusively for PC? / Will LawBreakers release on additional platforms? We’re initially developing LawBreakers for PC, then… who knows what the future holds? We are planning to run a number of upcoming tests before launch. Exact timings are still to be confirmed, but we encourage players to Wishlist the game on Steam to be first in the know about our upcoming announcements.